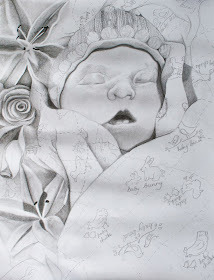 These are the details of March 27, 2010 - the day my daughter was buried beneath the earth. 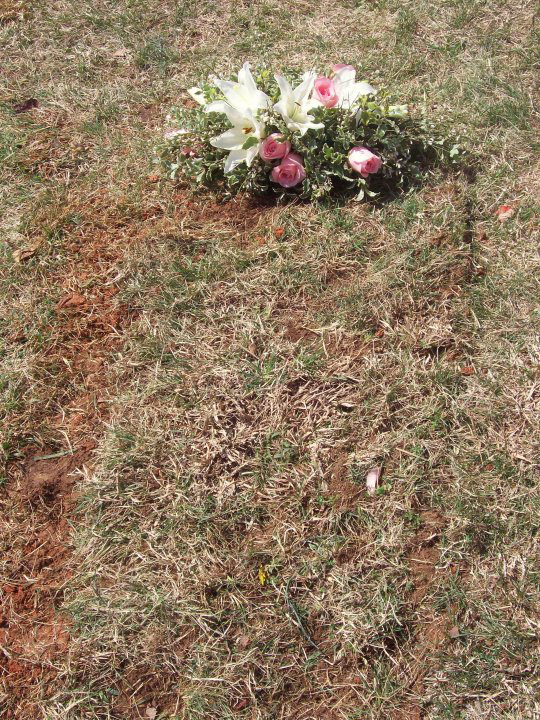 The day I left a piece of me in the ground in Virginia. 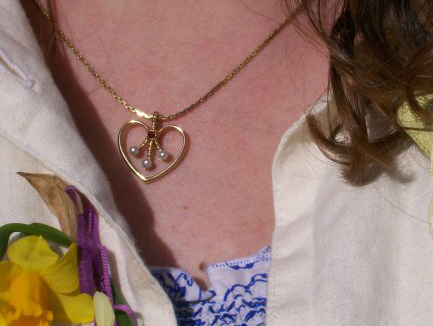 Before leaving for the service that morning, when I saw my grandmother (who also lost a baby), she gave me a beautiful necklace. It was a heart and symbolized the four generations - three pearls on the bottom to symbolize my grandmother, mother, and myself (living on Earth), and the stone above symbolizes Lily in Heaven. How incredibly sweet and thoughtful! It was so special to have to wear to the service. 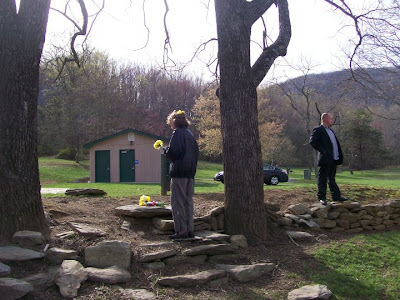 I wanted the service and burial to be as natural as possible, meaning no green tents, chairs, etc. (basically anything you think of when you hear the word "funeral.") It seemed like because she was a baby, she needed a more "babyish" service. I didn't want people wearing too much black. Her life had brought so much color to my world. And even though we were grieving, we were rejoicing that she was safe at home with Jesus and would never know a world marred with sin and pain. The service was lovely, just perfect. 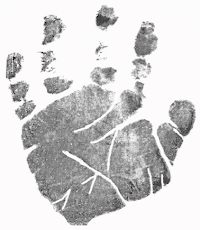 Looking back, the one thing I wish I could change would be to include programs with Lily's name, birthday, footprints, and a photo and poem perhaps, for people to take home with them to remember the sacred day. I also wish I had thought of and had the time to make a beautiful video tribute (like I've shared below) to play at her service. That would have been really special. As her obituary stated, under the open sky and surrounded by the majestic Blue Ridge Mountains, all were welcomed to gather around sweet Lily to celebrate her LIFE at the Hillsboro Cemetery in Crozet, Virginia. It was a time of mourning, yes, but not like those who mourn that have no hope (1 Thessalonians 4:13). 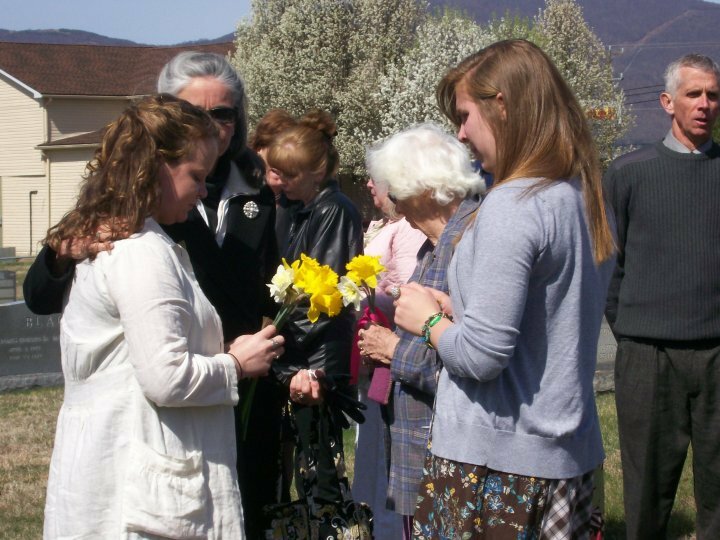 We celebrated that she was...and that she will forever be in Heaven. 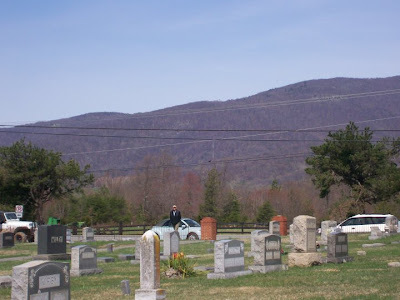 A partial view of the mountains from Hillsboro Cemetery on the day of Lily's burial. 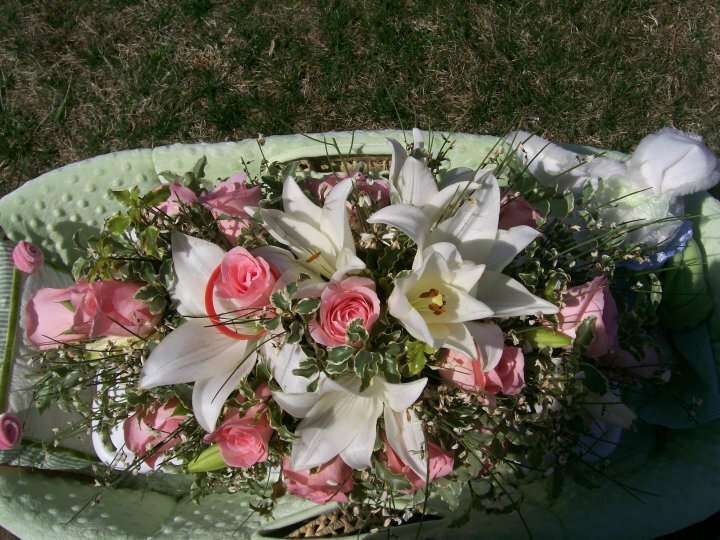 Of course, the flowers were roses and lilies, which rested on top of her little white casket. White, perfect for my pure and innocent one. Pink roses and and white lilies - such beautiful colors together. 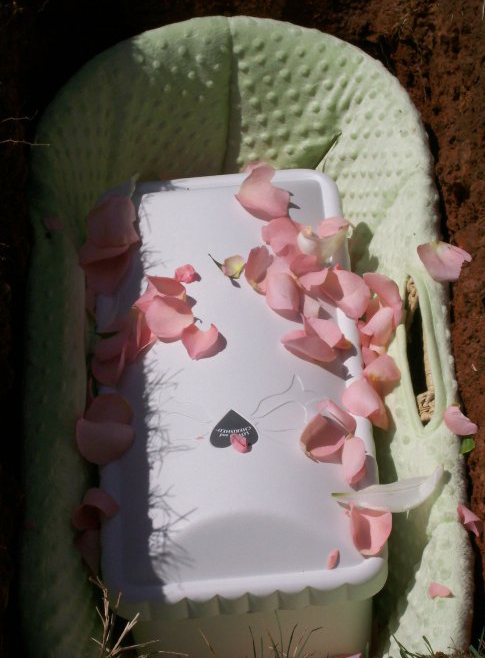 It felt wrong to see a casket that tiny. On top of the "little white box" as I called it were the words "loved and cherished." Yes, she was is. Thank you to my Aunt Helen and Uncle Scott for getting Lily's service flowers. 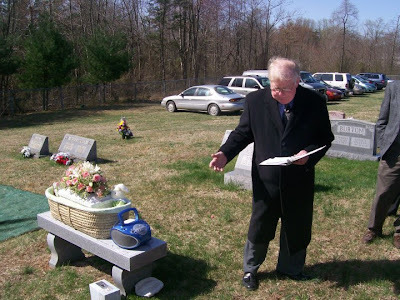 Our family's pastor growing up, Pastor Bob, efficiated the service. He baptized me the summer I was 14, he was there when I buried my child, and one day, I hope he will marry me. He has been with my family through the ups and the downs, the good and the bad. I am so thankful he was there as a special part of the day. For the service, we rested Lily's casket on top of my grandparent's and Aunt Rachel's headstone bench. 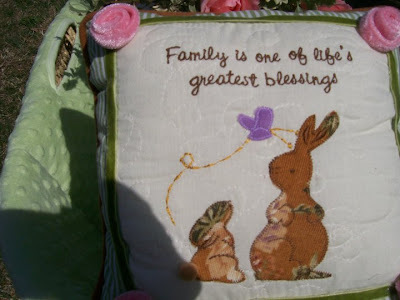 It is such a unique and beautiful bench that I sit on now when I visit Lily and my other family at Hillsboro Cemetery. 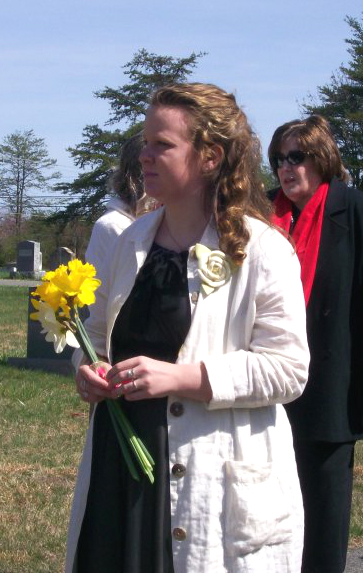 A family friend, Mrs. Deale, brought beautiful yellow flowers for several of us. That was such a sweet gesture that I will never forget. The flowers are now dried out. 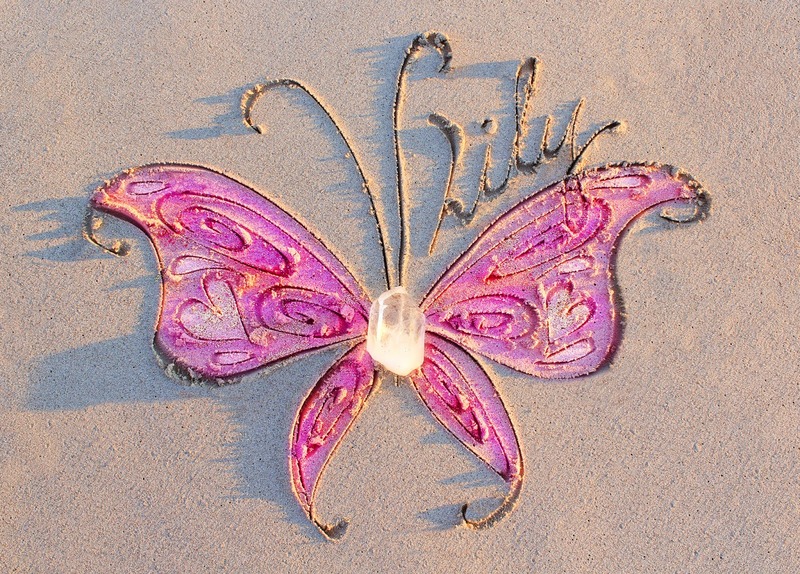 Some will go in a memory chest for Lily and some will go in a scrapbook. 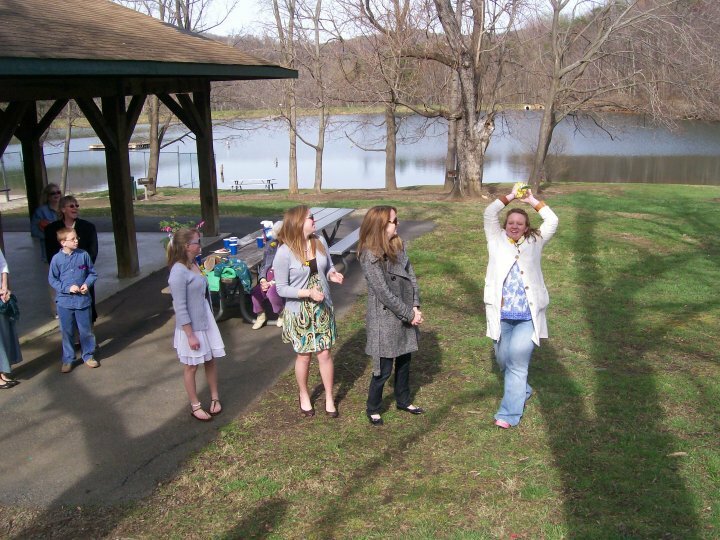 I wore my maternity dress, the very one I had worn a month and a half before at my baby shower. I got it at a cute little maternity shop called "Love in Bloom" across the street from Rex Hospital, where I had all my doctor's appointments and where Lily was born. That morning, I remember looking in the mirror at how the dress fell over me and I realized how different I looked in it this time than the last. The last time I wore it, it was filled with her life. It seemed only appropriate to wear it. The dress was black, so I splashed it up with a white coat. I guess the two colors matched my mixed emotions...the sorrow dancing with the joy. 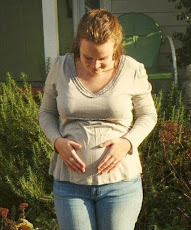 After only a week and a half since delivering a fullterm baby, I still looked somewhat pregnant. It was hurtful that more people didn't make more of an effort to come. I mean, I understand that life stuff is going on, but this sort of thing doesn't happen every day, to your friend or family member. 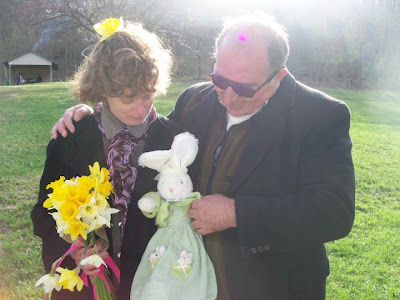 It felt like people thought other things were more important than mourning and celebrating my daughter's life with me. It's not like they can come at a further notice. It's not like they can come to her birthday parties through the years. This was it. Someone even told my mom that they couldn't make it because they had a baby shower to attend. What an ironic twist. There will be years to celebrate that life, but only one time to celebrate Lily's in this way... I guess the simple fact is people make an effort to be there for the things that are truly important to them. 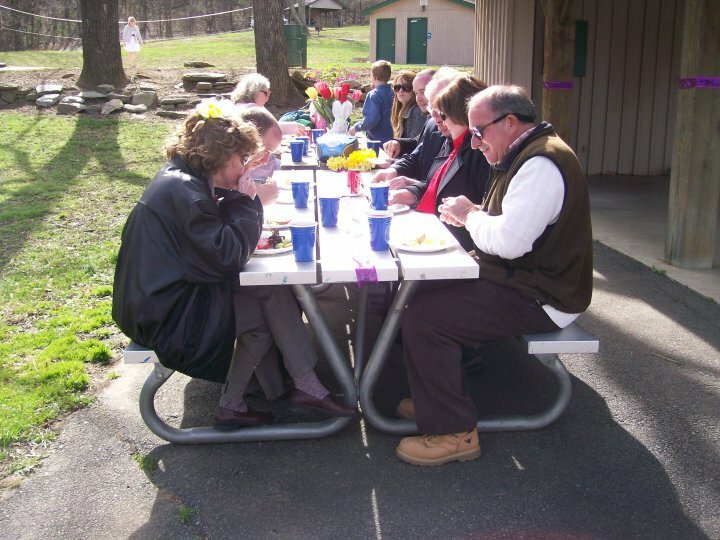 If this service had truly been important to them, they would have been there. I am thankful my best friend, Kala, took photos of the day. Someone asked her there why she was taking them, as if it was unthoughtful and strange. You see, these are some of the only memories I will ever have of my child. These are some of the only pictures that will fill a scrapbook just for her. 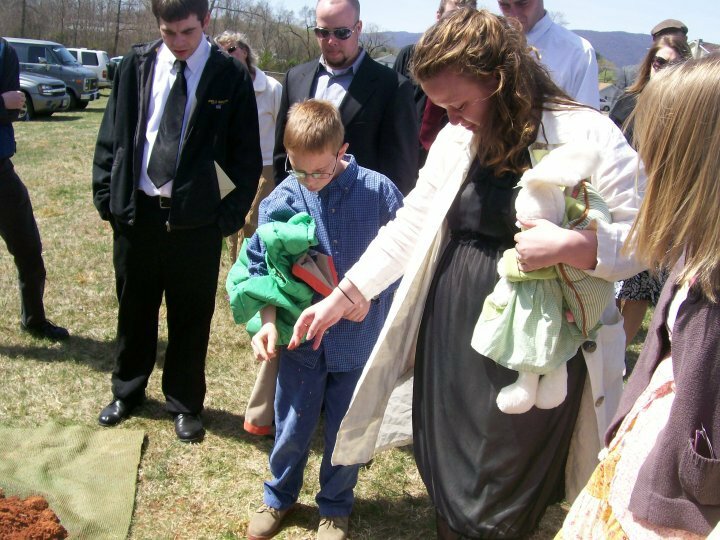 These pictures mean so much to me...I have heard several other parents who have lost a baby say they wish they had thought of taking photos at their child's service. 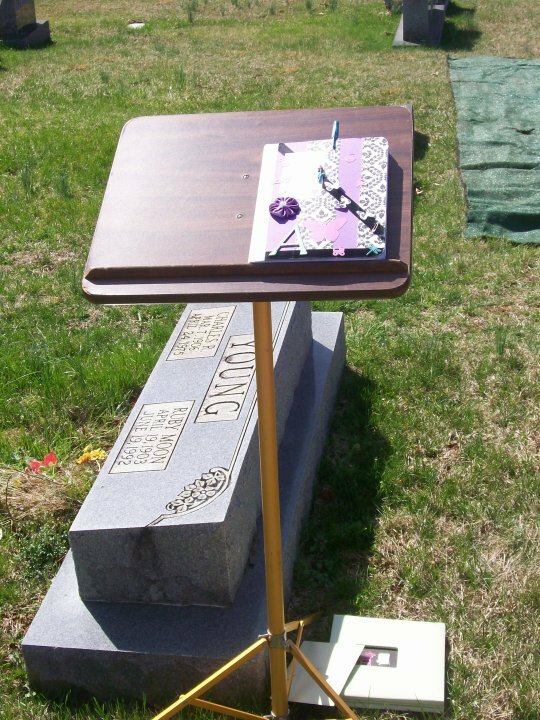 There was a place set up outside for friends and family to sign a special memorial guest book. 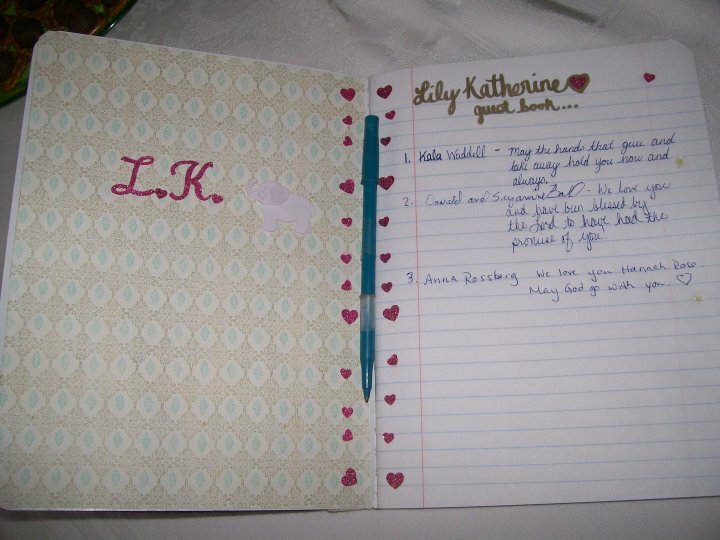 While I was pregnant, a family friend named Kathy (who my mom has known for decades) made me a very special journal in honor of Lily. I decided to use that for Lily's guest book - which was much more meaningful and prettier than a typical memorial guest book. People wrote sweet messages to me and Lily. It has Jeremiah 29:11 on it, which talks about the plans the Lord has for us. 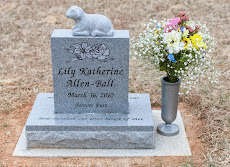 Though the plans He has for Lily's life and legacy are different than what I originally thought or wanted, He still has a plan and purpose, for her life and in her death. 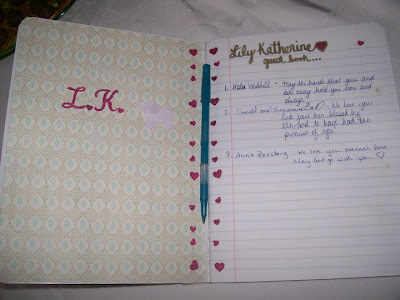 My best friend, Kala, decorated the inside cover for me, which I love. 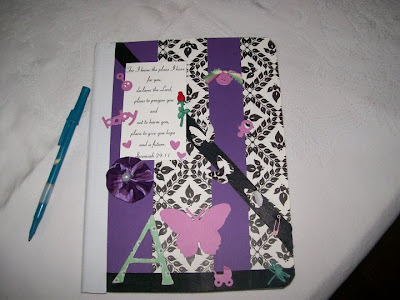 How appropriate that the book has butterflies on it, which have become very symbolic and meaningful to me. Pastor Bob spoke beautiful words and shared Scripture (one day soon, I hope to share the video recording of Lily's service - another thing I am so incredibly thankful to have). We had discussed the night before what I wanted him to say. I really left a lot of it up to him. My only desire was that all who attended the service would have their hearts and eyes pointed towards Christ. After he was finished sharing, I played three special songs. Songs that will forever remind me of my girl. Two of the songs I found on Jonathan's Journey blog a few months before losing Lily, before I ever knew what was to come. I remember sobbing as I listened to the songs and watched Jonathan's video. They left such a deep impact on my heart. I am thankful that God let me hear them because I remembered them when I lost Lily and had them for her service. I probably wouldn't have known about them if I hadn't of heard them before. I know the Lord led me to those perfect songs. The first song is called "Childhood Memories" and is a piano instrumental. It seems to express the emotions of having and losing Lily in a way words never could. The second song is my absolute favorite song and is called "I Will Carry You" by Selah. It was so moving and powerful for all to hear it at her service. Oh, I still cannot listen to it without crying. In the first few weeks after losing Lily, I would want to just get out of the house to be alone and would turn it up so loudly and bawl my eyes out. The words are absolutely breathtakingly perfect. That You would take my pain away. 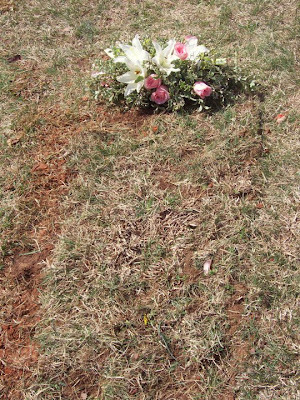 After the service ended, I knew it was time for the burial. 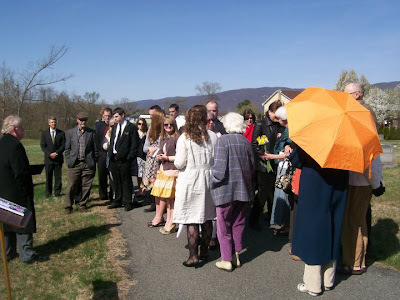 After everyone finished signing Lily's guest book, people were visiting for a while. Some people left, but many stayed. I had Lily's little bunny and pillow with her for the service and considered having them buried with her, but decided to keep them for her memory chest. Bunnies (and lambs) remind me of Lily. She was born shortly before Easter. 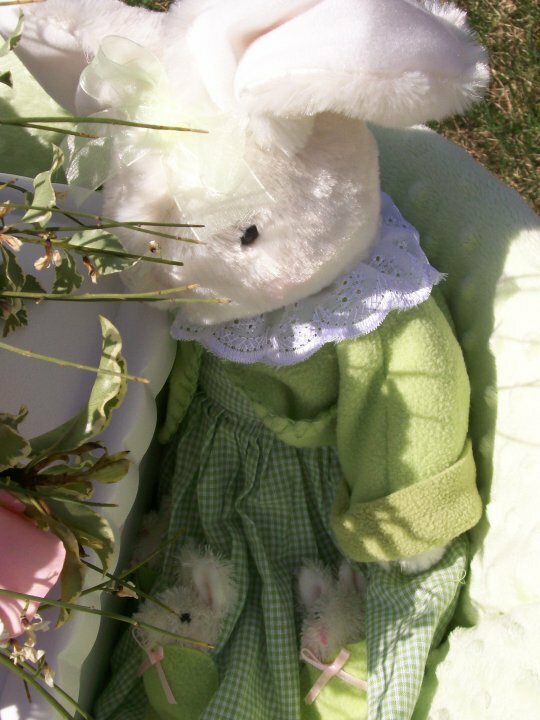 A mama and baby bunny - for me and sweet Lily girl. I am so incredibly thankful for the support and love of family and friends. I think this photo captures that really beautifully. 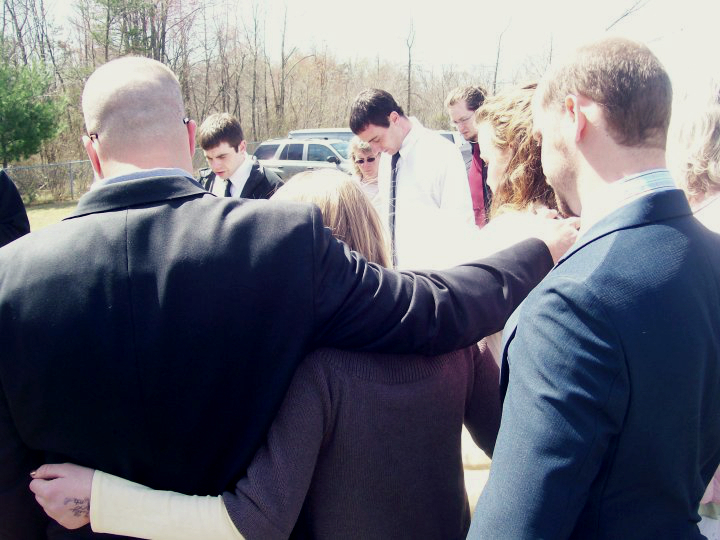 My family was standing around talking and through only the workings of the Lord, my Aunt Sarah (my mom's sister) decided to marry her fiance, Steve. They had been together literally since I was a baby and yet, she had never made the marriage commitment to him. Family and friends had been trying for years to get them to marry. It is an honor to know that my girl is the instrument God used to finally make it happen. 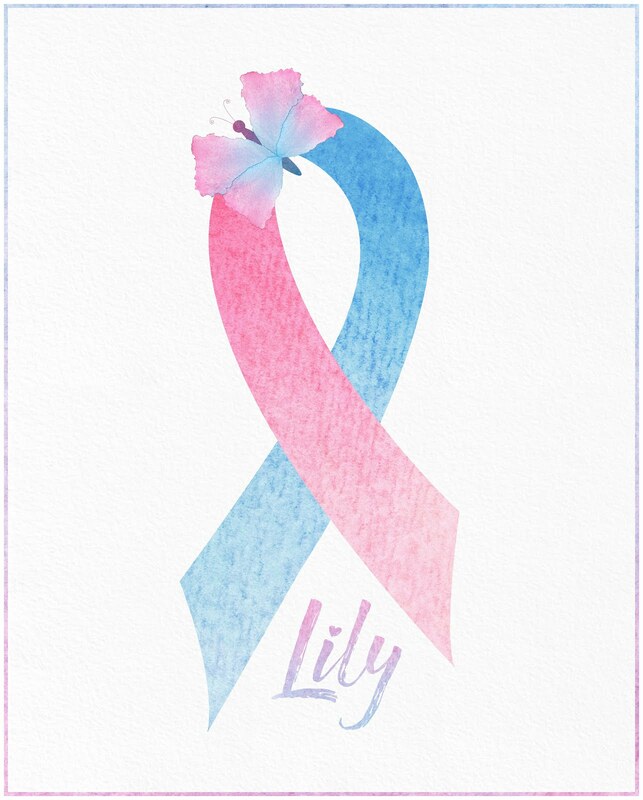 People are realizing how fragile and precious LIFE is because of Lily. This may sound strange and spur of the moment to some, but if you were in my family or know my family, you would understand this wasn't strange at all. It was so special and amazing. In a way, I didn't want the attention taken off of Lily for this special day, but I also wanted the day to be a reflection of how God works. There is mourning, but even more than that, there is joy and hope. Though Lily passed away, this marriage is a reflection of new life. Their new life together. 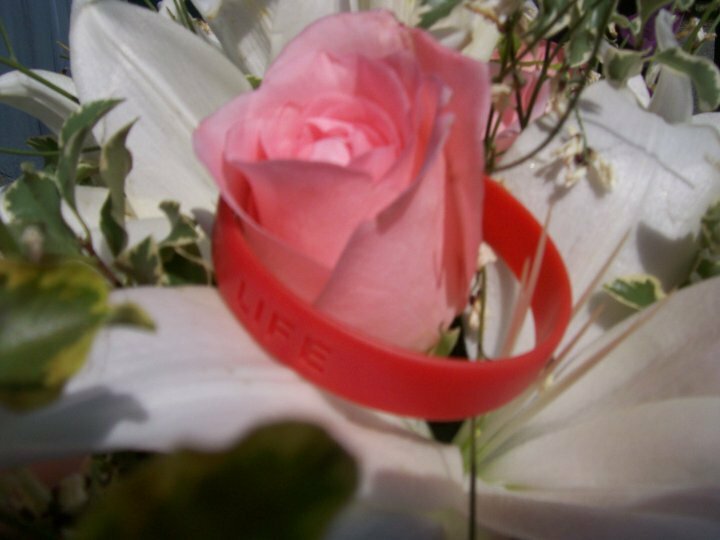 The hope of new life forever with Lily in Eternity. 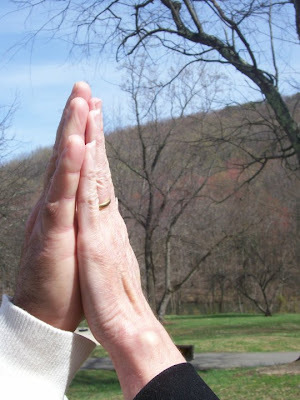 The marriage covenant is a symbol of the covenant between Christ and His Church. One day, He is coming again. It's His promise...and I cling to it. Because of the redemptive work God did through Lily's life, I will be ready for His coming and will be with Jesus and Lily forever and always! 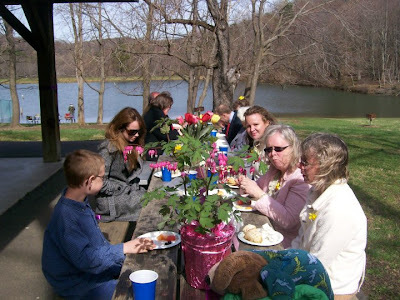 The family and a few close friends drove over to Mint Springs Valley Park in Crozet, just a few miles from Hillsboro Cemetery. We were planning a picnic lunch there, in honor of Lily. It ended up also being a wedding celebration. Pastor Bob married them on a hilltop there. We laughed and we cried. 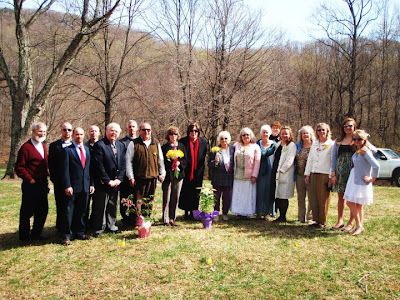 Pictured in this photo are me, my siblings, parents, aunts, uncles, cousins, grandmother, and Pastor Bob and his wife, Sharon. 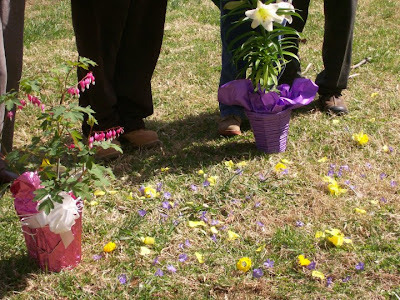 We sprinkled some of the flowers from Lily's service on the ground at the marriage ceremony. It was beautiful. In this photo, you can see the bleeding heart plant that was given to me at Lily's service the evening before (so perfectly symbolic). 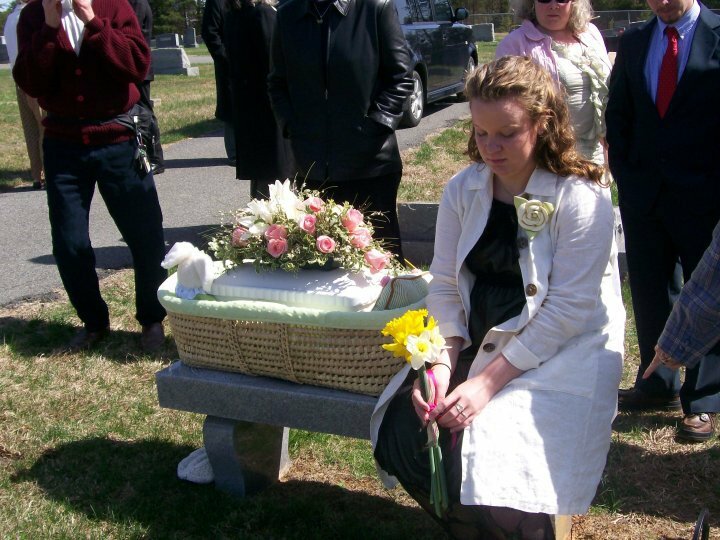 That plant is now in Lily's memorial garden and blooms each year around the time she was born. You can also see a lily plant that was given to me at her service. We ate and we celebrated. 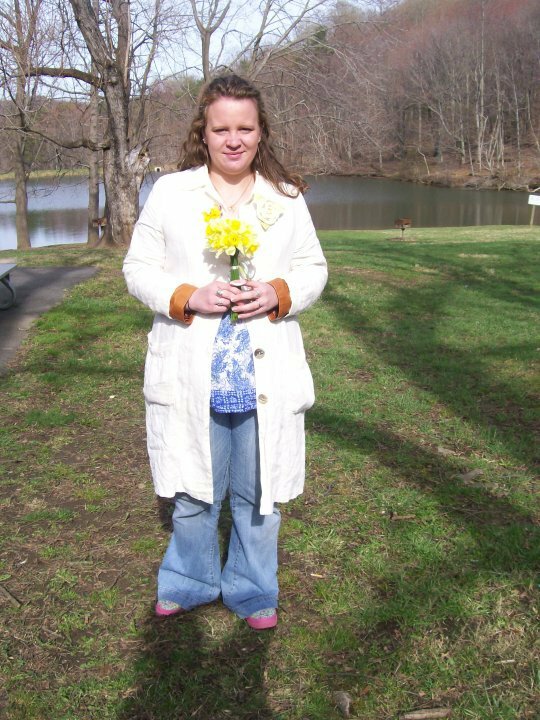 Aunt Sarah threw her bouquet, the very flowers I had held at Lily's service. She threw them and I caught them. It was a sweet reminder from my God that He has a glorious future planned for me. And a big part of that future is because of Lily and all He did through her precious life. 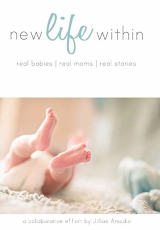 I am a new creation because of Christ Jesus and the plans God holds for my future are far better than I can comprehend and certainly far better than I deserve. 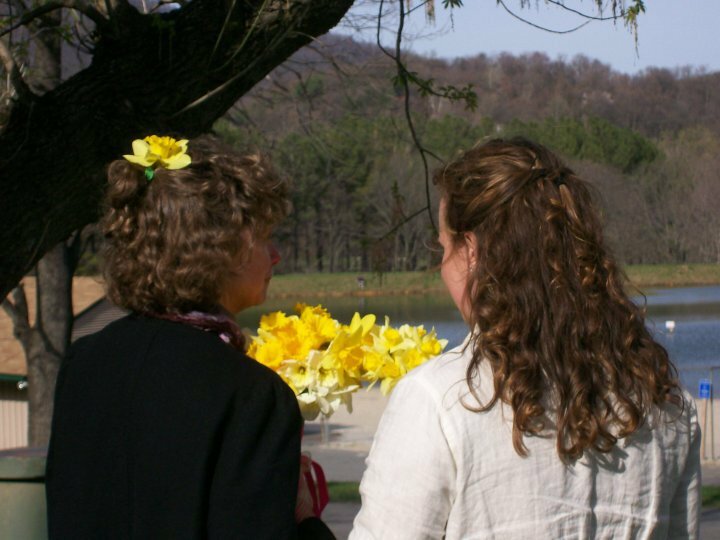 March 27th will always be a shared day for my Aunt Sarah and I - the day of my daughter's burial and her wedding day...somehow so beautifully intertwined. 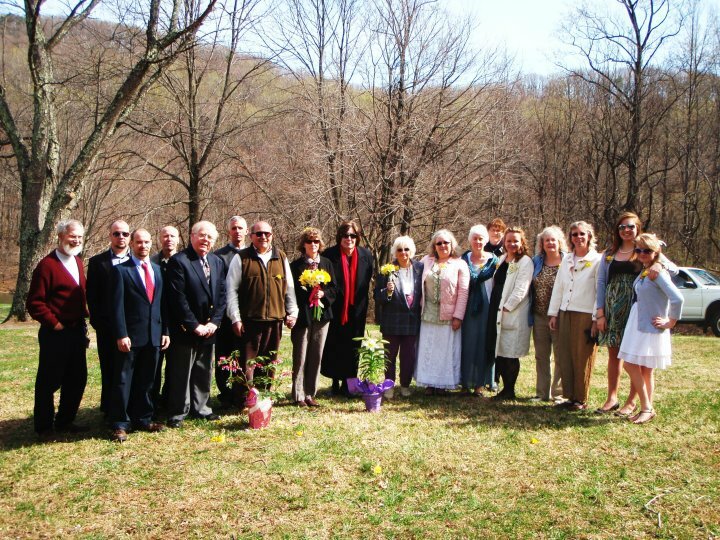 The day of Lily's burial will forever be remembered as a time of deep grief, yet a time of profound celebration. Thinking of you and Lily today. 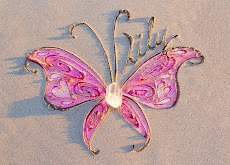 Lily is your guardian angel and she is always with you, loving you and protecting you. Love you always. Thank you for your testimony and allowing Lily to share hers. I cannot imagine the courage and vulnerability it took to write this. The Lord has used you both to speak love and truth into my heart and many others! Beautiful pictures in your post...Do you currently live in Crozet? We go down to Charlottesville often...We live in Alexandria. Crying, as usual! Sounds like a Beautiful Service/Celebration! Everything looks Perfect! IT look like a day with the finger print of God for sure so special!!! SO thankful for the testimony of sweet Lily and Luke!! Felt like I was there.... The way you describe the day. thank-you for sharing. I am grateful for the 2 pictures I took of my sons burial.